It is a sin to use the word "clip". Thou shall only use the word "clip" only when refering to stripper clips or the M1 Garand. What does Double Stack mean? What does Single Stack mean? What are some of the common single stack magazine types? What are the some the common double stack magazine types? How do I load a magazine? How can I quickly tell if my magazine is fully charged? 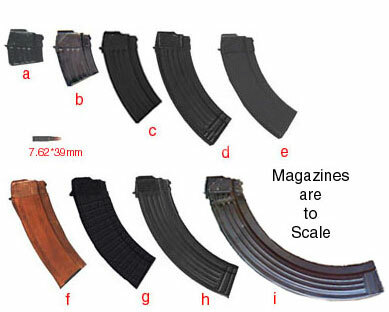 Single Stack is the term used to describe magazines that have rounds positioned in a single configuration as show in the diagram below. This is the configuration used in for low capacity magazines. Here is the common way to load a magazine. Step 2: Press down firmly until the round snaps into place. Step 3: The round is now loaded into the magazine. Step 4: To continue loading repeat the above process. Make sure that each round is clear of the front of the magazine. If not the magazine will not accept any more rounds. How can I tell if a magazine is fully loaded? Other then counting the rounds as they are loaded, if you look at the bottom rear of the magazine you will notice a small hole that is commonly called the "Witness Hole". If you can see a round the magazine is fully charged. 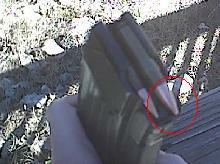 Magazine is fully charged, note the round showing through the hole.